A new technological metropolis, which is claimed to be the world’s first truly “smart city”, is expected to blossom in the desert of Saudi Arabia. A paradise for start-ups and developers run by robots and sustainable that could serve as an example to the rest of the world: NEOM. The plan for this “world’s most ambitious” project, the 10,230-square-mile smart city of NEOM in Saudi Arabia, was announced on October 24th, 2017 by Saudi Crown Prince Mohammad bin Salman at the Future Investment Initiative conference in Riyadh, Saudi Arabia. It is a primary part of the bin Salman’s Vision 2030, which is focused on reshaping the kingdom’s economy. While Saudi Arabia is more committed to its economic diversification and modernization agenda, a major project has attracted attention, as few others could have done. NEOM will be the world’s first real smart city. 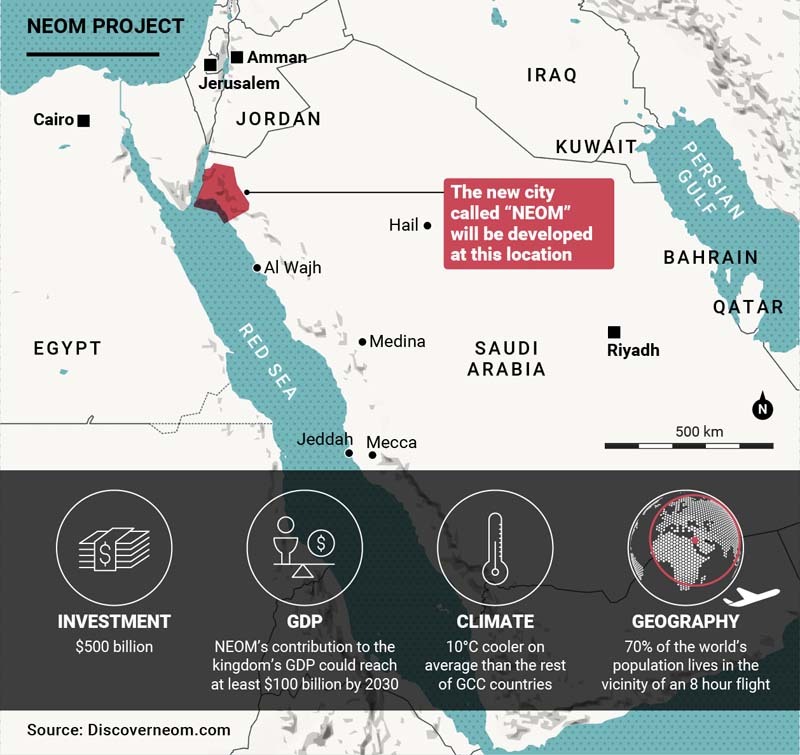 Saudi Arabia’s sovereign fund, the Public Investment Fund, said that NEOM would be the kingdom’s future commercial capital and be a hub unlike any other across the globe. A promotional video in support of the project touts NEOM as a visionary project and the smart city would contribute to the kingdom and world in a unique way. The smart city could contribute to the kingdom’s GDP alone by at least $100 billion by 2030, according to Saudi Gazette. The ambitions underlying plans for NEOM are unprecedented. The city will be developed in its own free zone, giving it the power to define and regulate its own taxes, customs duties, labor laws, regardless of the rest of Saudi Arabia. The city will function independently from the “existing government framework” as explained by the crown prince. It will have its own judicial system as well tax and labor laws. Furthermore, there will be modern technology to support the smart city and global hub of connectivity in terms of: energy and water, mobility, food, biotech, entertainment and more. There will be vast fields of solar panels, wind turbines, all-green transport systems, next-gen gene therapy, arid and seawater farming, natural parklands. Give priority to humans: the city will aim to create an “idyllic society” with comfortable living conditions. Automated Services: The city will be the first to offer “e-government”, a fully automated system for government services. Digitization: The city will provide all citizens with high-speed Internet access and online education, both completely free, through its Digital Air Initiative. Sustainable development: the city will only use renewable energy, and its buildings will have a net zero carbon footprint. Innovative construction: The city will encourage the use of new techniques and new materials to ensure that it can meet future needs. The first phase of the NEOM project is to be completed by 2025. In 2030, its promoters predict that the city will contribute $100 billion to the Saudi economy which is engaged in a vast diversification to no longer depend on black gold. Phase 2 is set to include in the second quarter of next year, when the execution and construction stage of the mega-project will commence. Preparing for the Connected World – What Skills are Necessary? ← Cognitive Science: Is It A New Promised land of Marketing?